With 28 days left in the regular season the playoff races in each conference simply are on fire. Almost every game has added significance, with points at such a premium, as teams jockey for positioning. NHL.com is here to give you a Down the Stretch daily that will highlight what you need to know about the games that directly can impact the playoff races. What's at stake: San Jose can extend its lead in the Pacific Division on Los Angeles and Phoenix to five points while also moving two points closer to second in the Western Conference. Chicago can move back into fourth place in the West with a win. 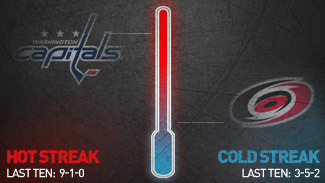 There's no denying it anymore -- the Capitals are peaking at just the right time. They've won eight in a row to remain the hottest team in the NHL. They have allowed only 12 goals during the winning streak. They want to stay in the race for a playoff berth in the Eastern Conference, but the Hurricanes haven't been doing themselves any favors. They've lost two straight and are winless in their last four (0-3-1). Carolina has fallen four points off the pace. How it's going: The Sharks are coming off back-to-back shootout losses and have just one win in their last four games. However, San Jose has managed four points in that span to stay within striking distance of the Red Wings for second in the West. The Blackhawks just finished a tough trip into the Southeast Division with a 0-1-2 record -- they lost in regulation at Florida, in a shootout at Tampa Bay and in overtime to Washington. They had won eight in a row prior to getting burned in the Southeast. Upcoming: San Jose stays on the road and goes to Dallas on Tuesday before coming home to play three in a row, against Minnesota, St. Louis and Calgary. The Hawks play in Dallas on Thursday and in Phoenix on Sunday. What's at stake: Tampa Bay can pull within three points of the idle Capitals for first in the Southeast Division while also extending its lead to four points on the sixth-place Canadiens with a win. Toronto can move within four points of a playoff berth but stay in 10th place with a win. Neither team can move its position in the standings Monday. How it's going: The Lightning are in a slump and it may cost them the Southeast Division title. They are 1-4-2 this month, including a 4-3 overtime loss to the Florida Panthers on Saturday. They have only 12 goals in seven games in March. The Maple Leafs are coming off a much-needed 4-3 win against Buffalo on Saturday. They got third-period goals from Mikhail Grabovski and Phil Kessel to keep their playoff hopes alive. James Reimer made 39 saves for his 13th win. Upcoming: The Lightning continue their Eastern Canadian road trip at Montreal on Thursday and in Ottawa in Saturday, and then return home next week to play the Islanders and Hurricanes. The Maple Leafs play another must-win game Wednesday at Carolina, and then they go to Florida on Thursday. They are home against the Bruins on Saturday. How it's going: Not well for the Wild, who have faded into the periphery of the playoff race thanks to back-to-back 4-0 losses to Nashville and Dallas. Minnesota hasn't scored a goal since it potted five in a route of the Colorado Avalanche last Tuesday. Niklas Backstrom lost to the Predators and Jose Theodore was in the net for the loss in Dallas. The Canucks simply are rolling. They've won five in a row and six of seven this month. Daniel Sedin leads the NHL with 89 points and he's second with 37 goals. Henrik Sedin leads the League with 67 assists and is third with 83 points. Roberto Luongo and Corey Schneider have formed arguably the best goalie tandem in the NHL; Vancouver gives up just 2.29 goals per game, second-best in the League. Upcoming: The Wild finish their four-game road trip in San Jose on Thursday, and then go home to play four straight, against the Blue Jackets, Canadiens, Maple Leafs and Blues. Vancouver hosts Colorado on Wednesday and Phoenix on Friday, then hits the road for four straight, in Detroit, Atlanta, Columbus and Nashville.